Tiberius Julius Cotys was king of the Bosporan Kingdom from 46 AD to 63 AD. He was the second son of Roman client rulers Aspurgus and Gepaepyris. Little is known on the life of Cotys I. When Aspurgus died in 38, his brother became joint ruler with his mother. Sometime before 45, the Roman Emperor Claudius gave his brother the whole Bosporan Kingdom to rule. 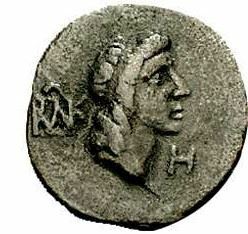 Claudius recognised and appointed Mithridates as the legitimate Bosporan King. In 45, for unknown reasons, Claudius deposed Mithridates from the Bosporan throne and installed Cotys instead. Sometime during his reign, Cotys married a Greek noblewoman called Eunice, through whom had a son called Tiberius Julius Rhescuporis. In 63, for unknown reasons, the Roman Emperor Nero deposed Cotys from his throne. The fate of Cotys is thereafter unknown. The Bosporan Kingdom was incorporated as a part of the Roman Province of Moesia Inferior from 63 to 68. In 68, the new Roman Emperor Galba restored the Bosporan Kingdom to Rhescuporis, son of Cotys.